in Search Marketing with tags Click through Rate, Cost-Per-Click, CPC, CTR, Google, PLAs, Product Listing Ads, Search Engine Results Pages, SERP Both comments and trackbacks are closed. On February 22 Google announced plans to modify the layout of its desktop Search Engine Result Pages (SERP) for queries where the searcher is looking to purchase a product or service. 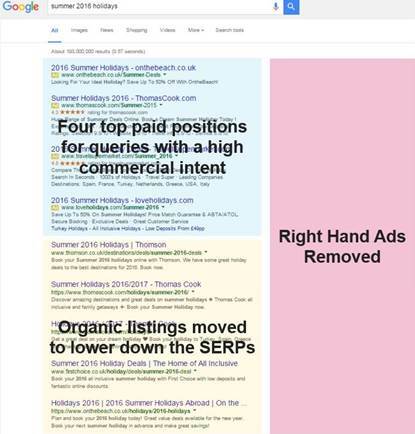 The announced changes included how SERPs would come to show a maximum of 4 ads above natural results, and ads in right-rail positions 5 through 7 would be moved below natural results. Ads in positions 8 through 11 would no longer be served, but Product Listing Ads (PLAs) and Knowledge Graph placements would continue to show in the right-rail. This post will examine how those scenarios have panned out over the past few weeks and explore how these changes have impacted natural listings. As Google implemented its SERP changes, many advertisers braced for a CPC increase with the fear that low-ranked competitors would raise their bids to remain on the page. However, 360i has compared performance trends before and after the change and concluded that this concern did not become a reality. To reach this conclusion, 360i aggregated NonBrand data produced from Google’s SERPs and developed regression models to analyze a two-week pre-change performance and a two-week post-change impact. 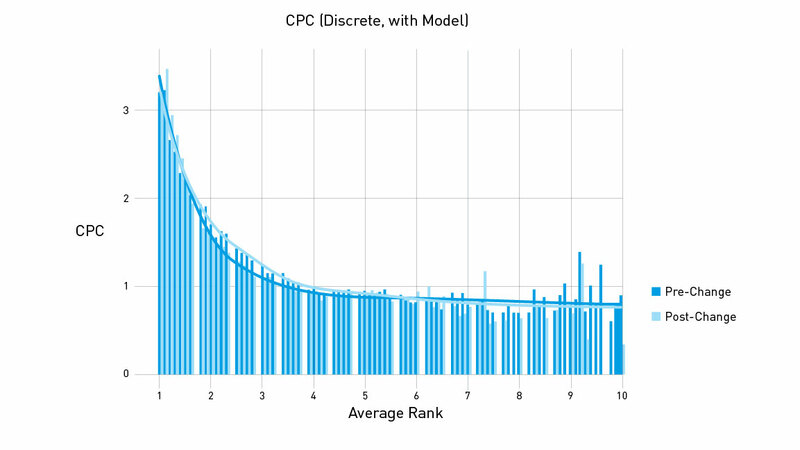 This method showed that marketers who had maintained top paid ad positions before and after the change only experienced slight increase in CPCs for position 1, and the SERP’s lower paid ad positions experienced improved cost metrics. While CPCs remained fairly consistent, 360i’s data analysis did reveal that CTRs experienced more changes. 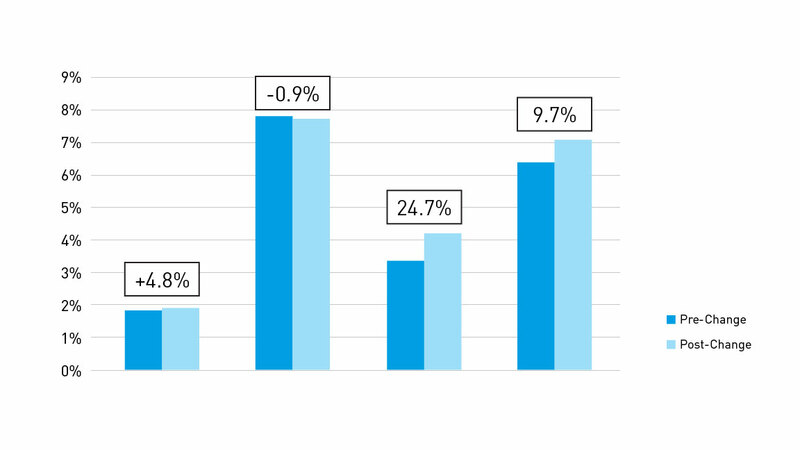 At an aggregate level, a statistically significant decrease in CTR was observed across ranks 1 & 2, but there was an increase across paid positions 3 through 5. Given these factors, the removal of the right-hand rail may help marketers moving forward. Improved CTRs will allow them to drive more traffic from ranks 3 through 5, and that will grant more opportunities to generate more back-end performance at better CPCs. The inclusion of an additional paid ad pushes natural links further down the page (and in some cases pushes natural links off the screen on laptop displays). Google released a similar change on mobile devices in July 2015 where an additional paid listing was added to the SERP. At that time, 360i began monitoring the before-and-after effect between paid and organic traffic, and a few months after the change, client data showed the share of paid mobile traffic increased while the share of organic mobile traffic decreased. To help determine the change’s impact, 360i evaluated the front-end metrics of top traffic-driving NonBrand terms across several accounts that leverage the agency’s SEM and SEO services. According to Google’s Search Console data, the CTRs for these client’s natural links increased by 3.9% in aggregate when comparing the pre-change period (2/8 through 2/21) to the post-change period (2/22 through 3/6). 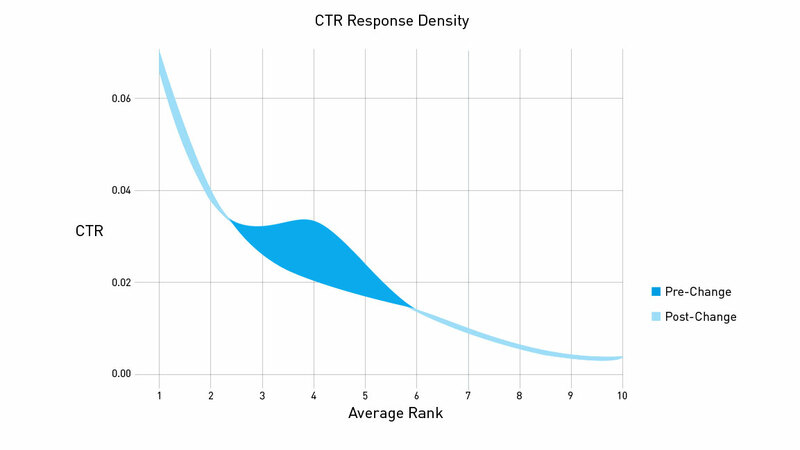 When factoring in the improved paid ad metrics in higher natural link response rates, the overall holistic CTRs improved approximately 10%-20%. As a result, Google’s changes have improved their link engagement rates across paid & natural, which can help marketers drive more clicks when engaged in both parts of the SERP. Continue to follow best practices across all SERP placements – The paid link, natural link and PLA tactics that worked prior to this update are still relevant today, so continue to implement those accordingly. Monitor holistic performance –If SEM is performing better than before, for example, determine if it’s at the expense of SEO or PLAs and adapt expectations accordingly. Be vigilant – A marketer’s competitors may be holding off on making major tactical shifts to see how this change impacts their performance. Competitors low on the page could still start to bid aggressively, causing future CPCs to rise. As the ancient Greek philosopher Heraclitus famously said, “The only thing that is constant is change.” Search engines will undoubtedly continue to make adjustments to their paid and natural listings in order to improve experiences for users and marketers alike. We’ll be keeping an eye on the updates, as should all marketers, to see how the changes continue to influence the search landscape.